The square Liangping pomelo will be available in Chongqing, China this year. 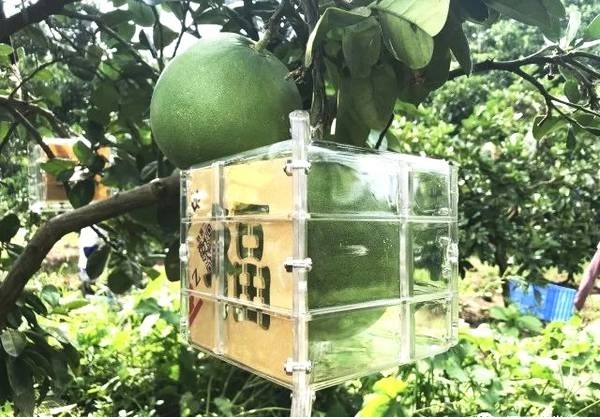 This square-shaped pomelo can be seen growing in orchards of Liangping District in Chongqing. Influenced and inspired by square watermelons in foreign countries, local people began to test and master planting techniques for growing square pomelos three years ago. The current technology of planting square pomelos in Liangping area is very developed. The first batch of square pomelos will reach the market this autumn. A typical Liangping pomelo harvested from a hundred-year-old tree costs 20 Yuan. While the square grapefruit is mainly sold in the high-end market, the price of each pomelo will exceed 200 Yuan—more than 10 times that of the regular Liangping pomelo. Transparent molds for growing the square shaped fruit were tested three years ago, according to the head of a local pomelo cooperative. During the first year, two out of 10 pomelos passed testing by the cooperative. The success rate increased to eight of the 20 pomelos during the following year. This year, the cooperative began small-scale planting, fitting 300 pomelos with engraved square molds. The appearance of ripe pomelos is not only changed from round to square but its skin is also branded with auspicious Chinese traditional characters. Molds for square pomelo production are custom-made from Fujian province and cost over 30 Yuan each. The molds are made of polystyrene resin - a material that is non-toxic, odorless, colorless, glass-like, brittle, and very transparent. The light transmittance of the molds can exceed 90%. Liangping pomelo is one of the three famous pomelos in China along with Shatian pomelo of Guangxi and Wendan pomelo of Fujian province. The flesh of Liangping pomelos is light yellow, sweet, juicy, fine and tender with a concentrated flavor. About 72.2% of the Liangping pomelo is edible. Its shape is usually divided into two types: flat and pointed. It has been awarded the national pomelo category's "golden cup award" and the "Beijing international agricultural exposition" famous brand product award in 1999. In June 2008, Liangping pomelo is also one of the first 28 geographical indication agricultural products approved by China's Ministry of Agriculture. It remains unclear whether fruits with unusual shapes, like the square grapefruit, will be accepted by the market despite its attractive appearance and eye-catching features. In Japan, although the square watermelon has attracted much media attention, it has yet to create additional income for local farmers. Instead, consumers treat the fruit as a piece of art. The mature square watermelon is not very popular in many markets. One reason is that the square watermelon doesn't taste better than common watermelons, yet it costs much more. In addition, transportation is more difficult with square watermelon, which also increases costs. Therefore, the success of Liangping square pomelo in the Chinese market is still uncertain.